Some writers would start this post by stating that there are no rules when it comes to which dips you like with which chips. But those writers would be wrong. Of course there are rules. With the Super Bowl approaching, it’s more imperative than ever that we abide by these hallowed and completely serious guidelines lest we suffer chip-and-dip misery. You think you can go dunking chips all willy-nilly? We’re not animals. So please, make sure that you and your loved ones abide by these tried-and-true, scientifically bulletproof mandates this coming Sunday. Mandatory for: Salsas, guacamole, black bean dip, queso. It is important to preserve the authenticity of your jarred Old El Paso queso fundido, so one must serve it alongside the traditional corn yin to its cheesy yang. 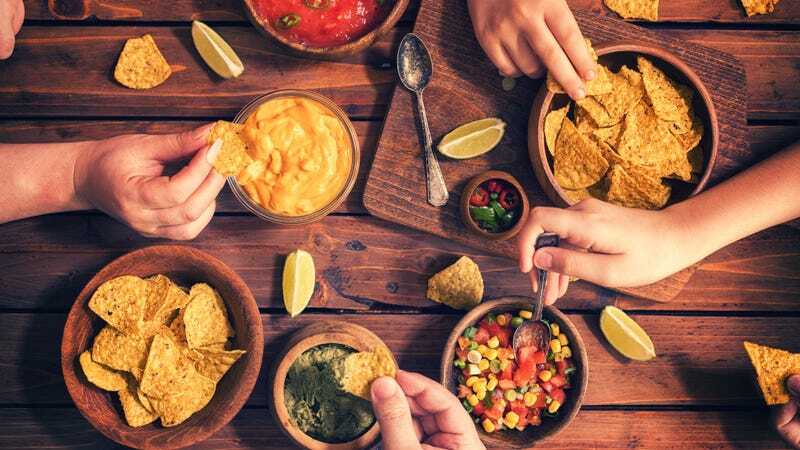 Tortilla chips deliver the necessary earthiness that tempers heat (salsa) and balances richness (guac, black bean dip, queso). Not advisable for: Hummus. Premade hummus already doesn’t taste like much, let’s be honest. Vaguely nutty and sort of earthy, hummus’ flavors are too close to corn for this pairing to end up as anything more than sad. Mandatory for: Sour cream-and-onion dip, bacon-cheddar dip, cheese balls. Potato chips—with ridges; we do not speak of the flimsy, unridged outcasts here—provide the necessary qualities for shoveling cream-based dips into our arteries. Ridges provide textural grip and structural fortitude; frying oil provides lubrication for our gullets; salt … just always helps. Not advisable for: Hummus, 7-layer dip, salsa. Salsa and potato chips theoretically aren’t wrong, but they just look unseemly together, like a man who doesn’t know his fly is open. It’s embarrassing and you should politely correct anyone who serves this. Mandatory for: Spinach and artichoke dip, yogurt-based or tzatziki-like dips, baba ghanoush. Ah yes, welcome to the Mediterranean portion of our dip spread. Mediterranean food is generally associated with freshness and herbs, but if we’re talking dips, we’re going more for saturated fats than omega-3s. Bagged pita chips are essentially air-popped cardboard, so while they don’t bring much to the table flavor-wise, they are the only vessel sturdy enough to handle artichoke chunks’ heft. Not advisable for: Literally anything else. “But hummus!” you cry. No, hummus and pita chips together are often so bland that they put party guests to sleep faster than Joe Buck’s “insights.” Try a hummus-and-pita-chip spread at your party and see if it’s not the last one to go. Mandatory for: Crab dip, smoked trout dip, buffalo chicken-cheese dip. This is the only chip that gets a brand-specific shoutout on our list because frankly, we will accept no Ritz substitutes, not even Club crackers. Their flakes provide just enough initial textural contrast to a creamy seafood or chicken dip before sublimating into smooth, buttery-cheesy-salty heaven. Not advisable for: Salsa, seven-layer dip, guacamole. Perhaps if one faced the imminent threat of nuclear war, he or she could be forgiven for desperately scooping guac out of a Tupperware with Ritz crackers. Note: This is only to be accepted in cases of national emergency and must never be spoken of thereafter. Mandatory for: Beer-cheese dip, honey-mustard dip. Is honey-mustard a dip? Are pretzels a chip? This is the most existentially vexing of the chip-and-dip categories. But it must be said that as soon as beer is added to a cheese dip, pretzels automatically become the delivery mechanism of choice for said dip. It harkens to friendly pub atmospheres of yore and provides a dry-nutty quality that helps cut through the beer-cheese indulgence. Not advisable for: Guacamole, salsa. Despite the migration of Austrian immigrants to Mexico in the mid-19th century (which gave the country its Vienna lager brewing traditions), Mexican- and German-inspired food traditions rarely meet to great success. Like a bratwurst taco, we’d also caution against pretzel-guac mash-ups.